The temperatures are dropping, the leaves are beginning to change, and spooky and fun costumes are in the works. Time for trick or treating! And no, we are NOT going to tell you to ditch the Halloween candy. What’s Halloween without treats? The best time to consume sugary treats is either with a meal, or right after. Your body produces more saliva during mealtime, so will help to wash away food particles, and cancel out some of the acids caused by bacteria. 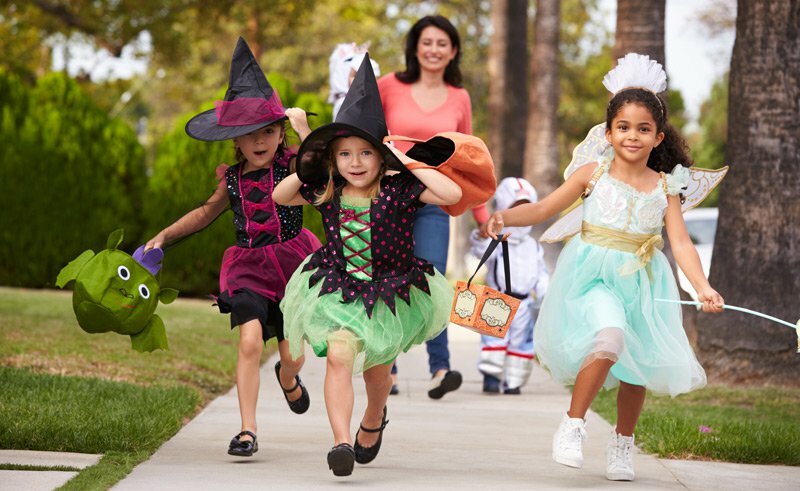 Since your child will be eating Halloween candy, make sure and limit other snacks they may eat during the day that contain sugar. You can set limits on how much candy they can eat, and when, and then limit their intake of sugar throughout the rest of their day. This includes soda, juices, sports drinks, etc. Your child may seem like a bottomless pit when it comes to candy, but if they are eating nutritious meals and snacks throughout the day, they will have fewer cravings for sugary treats. It’s easier to set limits on how much candy they can have when they start with a full belly. Also, make sure they’re drinking plenty of water, especially after snacks. Sticky and gummy snacks – they are harder to remove from the teeth, so may stick around longer than others, giving bacteria more time to do its damage. Hard candy – not only do they stay in the mouth longer, mixing with saliva and washing over the teeth, but they can actually break teeth if you’re not careful. Sour candy – these usually come in either gummy or hard candy form (see above), and they can also be very acidic. Acidic foods can weaken the protective shell of your teeth, making them more vulnerable to cavities. The BEST candy to eat? CHOCOLATE! Not only is it the most popular type of Halloween candy, it also washes off of the teeth faster than other types. And extra points for choosing dark chocolate, as it contains less sugar than milk chocolate. Earlier we promised we would NOT tell you to say no to Halloween candy. But let’s be realistic about it: does your child really need to eat all of the candy they receive? Many children come home with pounds of candy, and dream of eating it throughout the year… we actually do advise against that plan. So what’s a parent to do? (Sure, you could try to help them eat it yourself, but that may not be the best solution either). We recommend that you help your child choose what they will keep, and then donate the rest! Dr. Jeff Ward Pediatric Dentistry is holding a Halloween Candy Buy Back event at their Fayetteville location, where they will pay cash for your child’s “leftover” Halloween candy and send the collected candy to our military overseas. You can click here for more information. In most households with children, Halloween candy is going to happen. By helping them make smart choices, they will learn habits to preserve their dental health that will last a lifetime. Also, make sure your child is brushing twice a day, flossing once a day, and seeing their dentist regularly, not only to prevent problems, but also to catch any problems that may be occurring early. For more tips on keeping teeth healthy during Halloween, visit www.mouthhealthy.org.